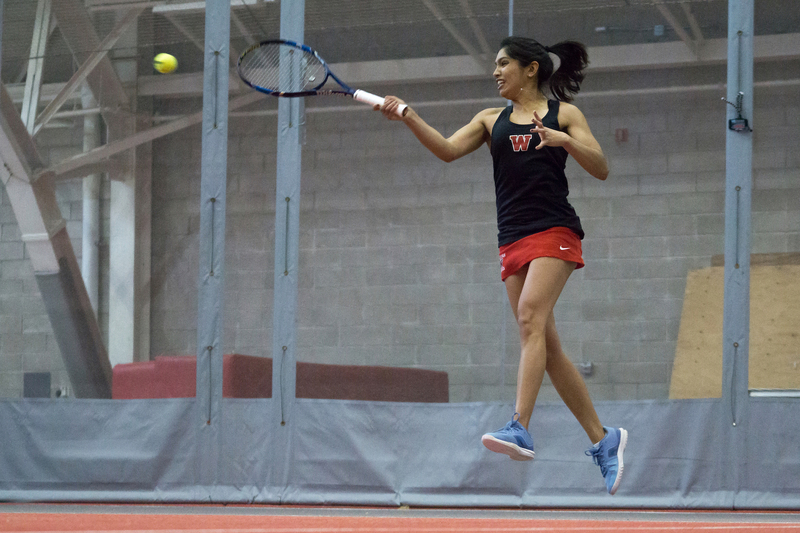 After suffering a narrow 5-4 loss against then second-ranked Bowdoin on Sunday, April 3, the women’s tennis team had high expectations heading into its match this week against defending Division III national champion and Little Three rival Williams. The Cardinals hoped to notch their first win against the Ephs in program history. While the Birds put forth a valiant effort, they were once again thwarted as the Ephs emerged victorious, with a 5-1 decision. With the loss, the Cards fall to 3-3 on the season and remain winless against NESCAC opponents. The match started off following standard protocol with doubles action taking center stage. The dynamic duo of Eudice Chong ’18 and Aashli Budhiraja ’18 at number one doubles put the Cardinals on the board first after a 9-8 highly competitive win that was decided by a tiebreaker. The Cardinals, however, did not fare as well on courts two and three, which in part could be attributed to the fact that this was the first competitive action for these newly reconfigured pairings. Each duo has only been playing together for about a week. At two doubles, Victoria Yu ’19 was joined by teammate Dasha Dubinsky ’18, while Helen Klass-Warch ’18 and Nicole McCann ’18 represented the Cards at three. While the change may not have proved successful on Saturday, these new pairings have the potential to cause a lot of problems for future opponents in the weeks ahead. Heading into singles, the Cardinals found themselves down 2-1. Despite their efforts, they were never able to draw even with the perennial powerhouse. The Ephs took the next three matches, and before the Cardinals knew it, the matches had been decided, 5-1. The straight-set wins came at first, fifth, and sixth singles for Williams. When play halted, second singles for Wesleyan was down 1-2 in the third set, third singles for the Cardinals was up 5-4, and fourth singles had just started, with the Ephs taking the opening and only game of the match. 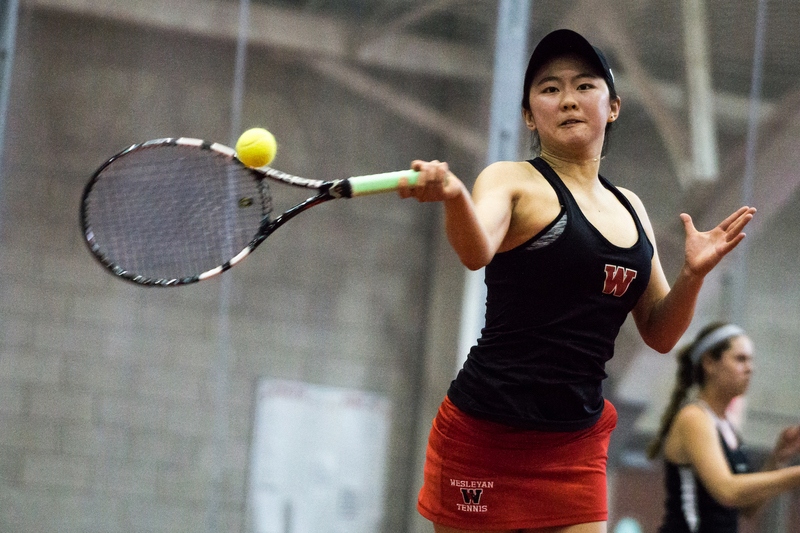 For the first time in her career at Wesleyan, Chong, the number one player, was unable to record a victory in singles for the Cardinals, twice falling 6-4. Despite the fact that the overall match score was 5-1 and the contest was not even fully played, the Cardinals never gave up hope of pulling off the upset. Over the past few years, the Cardinals have developed into a highly competitive program, hanging with the strongest teams in and out of the NESCAC. Rather than getting trampled, they can now assess their weaknesses and continuously improve as they steadily take that next step toward elite program status. These next several days will be a pivotal stretch of the season for the Cardinals, as they play three matches over the course of four days. Starting Saturday, April 16, the Cards look to right the ship and record their first conference win of the season when they travel to Clinton, New York to take on Hamilton, a team they have beaten ten consecutive times. Next, the team is back on the bus as the Cards make their way to Amherst to face the Purple and White. Upon returning to campus, the Cardinals will have a day off before they host Bates on Tuesday, April 19 at 3 p.m. While every match is important and every win counts in the record books and conference standings, a win against Amherst, a team the Cardinals have beaten only once in 36 meetings, would surely rank among the greatest wins in the program’s history.